The name says it all..a FUN DAY on the Island! 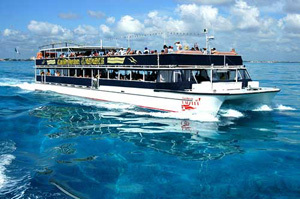 Sail to a beautiful island of Isla Mujeres on our double-decker boat. Once on the island there is so much to see and do! There is a kids club for the little ones, or you can nap in hammocks or get a massage, compete in water sports, learn salsa dancing, eat/drink to your hearts content, snorkel, dive, tour the island in a golf cart, bicycle and much more! This tour is perfect for families with kids of all ages. There is something for everyone! Tips: Comfortable shoes and clothing, bathing suit, camera, extra cash for souvenirs or tips. Private Club is totally safe for kids. Extra Cost Activities: Motorbike Tour $15 USD; Golf Cart $15 USD; Towels $3 USD.